Once upon a time in a forest of white trees and blue stars and hills snow-frosted like tall wedding cakes, there lived a princess. She was no ordinary princess, she was made of winter leaves and cold wishes and warm frost clouds of whispered dreams. Her skin was weaved by the white dew of Christmas morning and her hair was cobalt threads borrowed from the nights of december. She was called the Frost Princess. 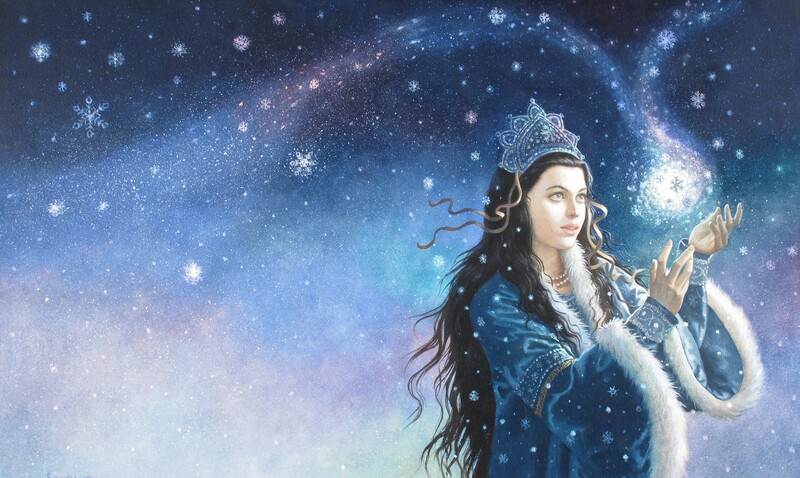 The Frost Princess was a magic being with the ability to travel between the many enchanted realms of the world. Wherever she went she rode on an ice bear, and carried with her a magic snow globe holding within it the maps of all the realms, and the location of the doors in which to enter into them. The Frost Princess’s father was the high and mighty King Winter, the ruler over snow and ice in all the enchanted realms. He wandered the White Forest, riding the northern light, wheeling high with the arctic stars in the blue skies of cosmos, climbing invisible ladders into the different realms. And with those words still lingering in the icy air King Winter lifted his daughter onto the back of her Ice Bear and sent her off into the sapphire sea of moons and stars. The Frost Princess and the Ice Bear flew through the heavenly realms of the White Kingdom of her father. The arctic stars wheeled around them, and the northern light Goddess Aurora twirled and spun and pirouetted lyrically in all her magenta, gold, emerald and indigo enchantments. It was a mosaic of starlight and color, hope and life. The Ice Bear landed softly on the white moss-covered carpet of the Evergreen Forest. The Frost Princess dismounted slowly and let her eyes fall on this new land called Earth. She saw tall trees, green valleys, lakes and mountain peaks reaching for the dense clouds in the pale blue sky. She did not know what to make of it all. “We will be needing a guide,” said the Frost Princess to the Ice Bear, “a human guide.” And just as she said that she heard a noise, the breaking of old dry branches and the rustling of fallen leaves, someone was walking nearby. “That must be our guide,” said the Frost Princess to the Ice Bear. “But we do not fit in in this land. We will frighten the humans.” The Frost Princess lifted her hand above her head and from her fingers snow showered down upon the Ice Bear, and all of a sudden he was no Ice Bear anymore, but a majestic reindeer casting his proud head about, feeling his new handsome antlers. The Frost Princess sprinkled the same magic snow upon herself and soon in place of the beautiful white princess there stood a small black raven. not long after the spell was done the human guide appeared behind the trees. It was a little girl. The Frost Princess flew out to meet her, while the Ice Bear, now a reindeer, waited in the shadows of the trees. The girl’s name was Maika and she belonged to one of the cottages near by. She often wandered around in the forest alone, making up little stories for herself to enjoy. When Maika saw the black raven on the pathway in front of her she was delighted. “Hello little raven,” she said politely, “where are you going today”? “I was hoping you would tell me that,” answered the raven. Maika jumped in fright, for never had she heard a raven speak before. She wanted to run away, but something prevented her legs from moving, something that felt like magic. Maika stared at the little raven, not being able to take her eyes from it. The raven skipped about from one leg to the other, fluttering its feathers as if it wasn’t quite sure how to use them. “You need not be afraid of me little girl, ” said the raven, ” I mean you no harm. I come from a far-away land and could use your help to find my way about in this forest. Can I be so bold as to ask for your name ?” Maika stood still, enchanted by the raven’s speech, but she was a polite girl and as she remembered her well-taught manners she stuttered in reply: ” My name is Maika and I am sure I will help you if I can.” “Thank you Maika, that will be most appreciated,” answered the raven, “you see, I am not quite what I seem to be, but this is not a good time to explain my true identity, for now, call me Raven, and come and meet my dear friend Rein.” Maika nervously followed Raven as she lead the way to a dark patch behind a grove of tall green trees, and there, sheltered from the bright afternoon light, stood a beautiful magnificent reindeer! Maika had never seen a real reindeer before, but she had heard about them in stories. “Does he talk too?” she asked Raven. “no, but he can understand what we are saying. Sometimes he talks to me, but silently, inside my mind,” Raven replied. “Can I pat him?” asked Maika shyly. “Oh, yes, he would love that,” said Raven. Maika approached Rein carefully and put her little hands around his big face, it was so soft and warm. “You are beautiful,” whispered Maika into his ear. She did not hear anyone speaking back to her in her mind, but when she looked into Rein’s big chestnut eyes she could feel that he said: Thank you! “We have come here on a quest,” said Raven to Maika, who was still keeping her hands buried deep into Rein’s lovely silky coat. “And we need your help to solve the quest, ” continued Raven. Maika looked up at her curiously and asked timidly: ” What kind of quest?” Raven skipped over to her and settled on Rein’s back. “Maika,” she began, “when was the last time you saw snow?” “Snow?” asked Maika, with a confused look in her eyes, “what is snow?” “Snow,” replied Raven, “is like soft white rain that falls from the sky in winter when the air is cold, and the sun is pale and coy, and the forest whispers of frost and moonlight. When the land sleeps early and the bravest animals dance on frosted lakes under clear white stars. And then, when the nights seem to overshadow the days, and the sun becomes the memory of light, the blue twilight appears and the brightest star is born, and the world turns in its wintery sleep and begins to dream a new dream, and then all of a sudden the land starts wandering over the white hills and barren moors, towards that newborn star glowing in the distant horizon. And that, my dearest Maika, is what we call Winter.” “Oh!” was all Maika could say. She fell silent for a while, pondering in her heart, the beauty and the meaning of what Raven had just said. After a little while she looked longingly into the pale blue sky and whispered, almost only to herself: “Then snow is the beginning of magic and I want to see it.” “You will,” said a voice inside her mind, “but you will have to help us find it first.” Maika startled as Rein gently touched her cheek with his muzzle, it was his voice she had heard in her mind. “I will help you,” she said out loud. “Just tell me what I have to do.” “We have to find someone who has seen snow in their lifetime,” said Raven, “maybe they can tell us how it disappeared.” Maika thought long and hard about this. The oldest person she knew was her grandmother, but she had never told Maika anything about snow. But she had told her fairy tales from the ancient times, fairy tales everybody else seems to have forgotten or lost interest in. Maika remembered one fairy tale about a people called “the nisse folk”, the nisse folk were small and shy and could live for 300 years! They must know about snow, thought Maika to herself. “I think we need to go to the mountains,” said Maika to Raven and Rein, for it was in the mountains the nisse folk lived according to her grandmother’s fairy tales. “The mountains it is then,” said Raven. “But how will we get there?” asked Maika in a confused voice. “Oh, that is not a problem,” answered Raven, “just get on Rein’s back, he will carry you.” Maika did as she was told and before she knew it she was flying through the air! Maika had never heard of a flying reindeer before! She stretched out her arms and laughed as the wind grew in strength and blew her hair away from her face. “To the mountains!” she shouted excitedly, and towards the mountains they flew. Out of what looked like nothing but thin air a snow globe magically appeared in Maika’s hands. Maika stared at the snow globe with wonderment in her eyes. Where did it come from? she thought to herself, and what was it? Something white swirled around in there, something that sparkled with life and magic. “This,” said Raven, “will show us the entrance to the mountain.” Raven gently stroked the snow globe with her wing and spoke something into it so softly that Maika could not hear what she was saying. All of a sudden the white sparkly threads in the globe changed, they started spinning faster and faster until an image appeared. At first it was blurry like a little toddler’s painting, then shapes started forming, and Maika could clearly see the mountain. It was the same mountain they were standing in front of, and now a tiny door appeared in the snow globe, so camouflaged by the greyness of rock that it was almost invisible, but when Maika lifted her gaze from the snow globe to the actual mountain side she could clearly see the door. It was as though it had been brought out by the magic of the snow globe! But as the door become more and more visible, something else appeared as well, a tiny bearded creature, with a long cap and pointy ears, standing firm in front of the door. The entrance was guarded by none other than a nisse! The nisse opened the door slowly and let her inside the mountain. Together they walked through a long dark tunnel that lead them deeper and deeper into the mountain, until another door appeared, a little smaller than the entrance door. The nisse led Maika through the door. Maika stepped into a big room flooded in golden light, and on a white throne in the middle of the room sat the King. “Wait here, ” said the nisse. He stepped into the room and called another nisse, this one was much younger, and he was dressed in white from head to toe. “This is the King’s personal guard,” said the older nisse to Maika, “he will present you to the king.” Maika let the white-clad nisse lead her to where the king was sitting. “Bow to the king” said the guard, and Maika bowed as deeply as she could. “This girl has come to see you my king,” said the white guard to the king. The King looked at Maika sternly, “and why have you come here little girl?” he asked. Maika felt very frightened, but she knew that Raven and Rein was depending on her, so she mustered her courage and said as sweetly as she could: “I have come to ask you about snow, your royal highness. Have you ever seen snow?” The king looked at her curiously, ” yes I have little girl, but that was long ago, when I was only a very young prince.” “Do you remember how it disappeared?” asked Maika eagerly. The king shook his head, “no, I do not, but you should ask the Weather Witch, she has been around a lot longer than me, and she will know about these things.” “And where will I find this Weather Witch?” asked Maika. “She lives up in the north, at the highest peak of the Trollheim Mountains. But I must warn you, the trolls living in Trollheim are not all friendly, some of them have grown bad tempered and will not take kindly to visitors.” Maika swallowed hard. She remembered trolls from her grandmother’s fairy tales, and she did not like the idea of meeting one.”Thank you,” she said politely to the king. “You have been most helpful, I must leave now.” The king bid her goodbye and the guards led her back out to where Raven and Rein were waiting. As soon as the door to the mountain closed behind Maika, it again disappeared out of sight. “Could the king help us?” asked Raven as soon as they were alone again, Maika nodded her head, “yes, he told us to go to the north, through Trollheim, and look for the Weather Witch, she will know how the snow disappeared.” ” Well done, Maika,” said Raven warmly, “now let’s hurry up and find this Weather Witch .” Maika climbed onto Rein’s back and off into the night they flew. The night was thick and dark and the grey mist unfolded like a spiders web drawing nearer and nearer to the centre in front of them. Maika could see the blackened mountains growing in size and hight. They must be getting closer to Trollheim. The only directions they had was to keep going north. Soon a majestic peak that looked as though it was touching the moon itself appeared infront of them. It was dark and menacing and Maika felt frightened. “It must be here,” said Raven, “let us land.” Rein slowed his pace and let himself gently drop to the ground. There was nothing but solid rock to land on, and Maika was sure his hooves must be sore by now, but Rein showed no sign of discomfort. Maika jumped off his back and looked around her. Everything was so dark she could not even see her own feet. “Here, hold on to this,” said Raven, and out of nowhere a torch appeared. Maika clutched her fingers around the torch and waved it back and forth in the air to see the landscape around her. “Who goes there! !”, roared a voice not far from where Maika and her friends were standing. “Who dares trespass on my property! !” the voice sounded dark and thunderous, and when Maika turned the torch towards the sound she discovered to her great horror that the voice belonged to a gigantic troll! Maika’s legs stiffened with fright as she saw the enormous troll staring at her. He was as big as a mountain! and when Maika looked down at where she was standing, she discovered to her great horror that she was standing on the troll’s body! “E-e-e-excuse us,” Maika stuttered. “We really did not mean to trespass, I hope we didn’t hurt you.” The troll let out a loud roar, whether it was a roar of anger or laughter Maika did not know, but it was nevertheless menacing enough to make Maika shiver from top to toe. The ground underneath her feet was shaking as the Troll’s roar became louder and louder. Then all of a sudden a flair of light appeared in the night black sky. The light grew in strength until it was as though the sky was lit up by a nocturnal sun. The troll stopped roaring and his eyes became small like little glass marbles. “Trond!” said a voice coming from the light, “you promised to behave!” The troll looked as though it shrunk in size. Out of the light came a little boy, about Maika’s size, he held in his hand a ball of glowing light. He held the ball of light up to the troll’s face. The troll looked nervoulsy at the light, he was clearly afraid of it. “You are not to harm these people, Trond!” said the boy. The troll, who’s name appeared to be Trond, withdrew into the shadows, and Maika could no longer see his face. “Hello, little girl,” said the boy to Maika, “my name is Sebastian and I am the Weather Witch’s apprentice.” Sebastian bowed to Maika. Maika smiled and bowed back to him, “and I am Maika and these are my friends Rein and Raven,” she pointed at the animals, “and it seems we are in luck today, because we were actually on our way to see the Weather Witch.” “Oh, she will be much pleased to see you,” said Sebastian, “she hardly gets any visitors, but I am afraid it is rather far to walk, perhaps a day or two if we hurry.” “That will not be a problem,” said Raven, who apparent had decided that the boy could be trusted, “just jump onto the Rein’s back. He will easily carry both of you.” Sebastian smiled in delight, and he and Maika climbed up on Rein’s back, and together the four of them started their journey to the Weather Witch. “You see that peak shaped like a pencil?” Sebastian pointed towards a tall slim mountain far ahead on the horizon. Maika looked in the direction Sebastian was pointing. The peak was not difficult to spot, it towered over the other mountains very much like a pencil, but a pencil without an end, for Maika could not see the tip of the peak, it looked as though it went on and on into heaven itself. Rein quickened his pace and dashed over the sky like a shooting star. He soon reached the witch’s mountain, but the climb upward to the top was heavy, even for a strong animal like Rein, and he panted heavily under the weight of the two children. But he did not fail them, the peak was reached and the children could dismount safely. “This is where the witch lives?” asked Maika Sebastian. “Yes, just look there between the clouds.” And as Maika looked, the clouds parted and a castle appeared out of the mist. The castle was surrounded by trees and shrubs and the castle towers stood tall over the clouds. “Come with me,” said Sebastian encouragingly, “she will be so happy to see you!” Maika hoped he was right. She had to admit to herself that she was a little frightened of the witch. Rein, Raven and Maika let Sebastian lead them in through the castle door and into the courtyard. “Madam, Madam! I am here! and I brought guests!” called Sebastian out. not long after, Maika could hear a sound, it was coming from the air and it sounded something like: Swish! Swosh! Swish! Swosh! SWISH! SWOSH! SWISH! SWOSH! The sound became louder and louder, and there, from behind the tall trees a figure appeared. It came closer and closer untill Maika could see that it was a lady riding a broomstick. She was clad in blue and on the tip of the broomstick a black cat sat comfortably, seemingly not at all afraid. “That’s her!” whispered Sebastian enthusiastically in Maika’s ear. “Hello Madam,” he called to the witch, “I am so glad to see you, here are some guests I brought for you.” The witch landed on a little knoll of grass right in front of them. She was not at all as old as Maika had assumed she was, and she was very far from ugly, in fact she looked quite sweet! “We are looking for the lost snow,” said Maika, quite confidently this time. Raven perched on her shoulder, but she did not reveal to the witch that she could talk. “Ah yes, snow…, it has been gone for years. I am afraid getting it back is rather tricky.” “Oh, so you know how to get it back! !” exclaimed Maika excitedly. “Well me dear, I know who can help you get it back, but the road to her abode is long and full of riddles. Are you sure you are brave enough to embark on such a challenging quest?” Maika did not have to wait for Rein’s reassurance this time, she said boldly and without a doubt: “Yes, yes I am!”. “I am afraid your animal friends may not come with you, for I sense they are more magical than they appear and magical beings will not be allowed on this quest.” Maika swallowed hard, again she would have to do this alone, but again she mustered her courage and nodded her head to the witch. “The place I am sending you to,” said the witch, “is the spinning realm. In this realm lives the Lady of the Spinning Wheel. She is the one who spins and weaves the stories that makes up this world and many many more. She will know how to bring back snow. But to get the to spinning realm you first have to cross the enchanted realms, and these realms are full of riddles and tricks, it might not be such an easy task to navigate through them. But I sense your friend the raven might have something that can help you..?” Raven flapped her wings a few times and all of a sudden the magic snow globe appeared in Maika’s hands. “Thank you,” said Maika warmly to Raven. “now child, you must go right away, soon there will be no time left, for the door to the spinning realm will close by midwinter.” Maika tucked the snow globe away under her coat and readied herself to leave. “I will be with you,” said a voice in her mind. Maika smiled to Rein and he stroke her hand with his muzzle. “Encantata Edamius realmus victus!” said the witch in a loud authoritative voice and all of a sudden the trees gave way to a hidden door behind the shrubs. “Be safe me dear!” said the witch and gently pushed Maika through the door. The fairies carried Maika on the swing up to the door in the sky. When they reached it, they gently let her down on the threshold of the door. Then one of the fairies plucked off her own beautiful wings and attached them to Maika’s back. The minute the wings touched the astonished girl’s back they grew in size until they fitted her perfectly. “Oh, thank you so much!” Maika said sweetly to the fairies and fluttered her new wings excitedly. The fairy who had given Maika her wings smiled shyly and did a little curtsey. Then all the fairies flew off into the woods, the wingless fariy was helped by her sisters. Maika peeked curiously through the door. She could see vast forests and a blue river and a beautiful starry sky, and there, situated on the river bank was a castle. “That must be where the Lady of The Spinning Wheel lives,” thought Maika to herself. It was time to give her wings a proper try. “Imagine you are a bird in the sky,” said Rein’s voice in her mind. Maika lifted her new wings and let herself fall from the door into the sky. Maika tried as hard as she could to imagine she was a bird, it almost worked, but as soon as she looked down she felt like a little frightened girl again. So she decided to keep focusing on the castle and to not look down to the ground at all. Little by little she approached the castle by the river. It was a beautiful castle with pink windows and a rose garden, and a courtyard full of apple trees and little bunnies hopping happily about. Maika felt that it was the most beautiful place she had ever seen. She managed to land in one of the apple trees, and as soon as she was sitting safely on one of the branches her fairy wings magically disappeared. Maika hoped they travelled back to the pretty fairy who had so bravely sacrificed them for her. Maika climbed down from the tree, walked out in the lovely courtyard and started looking for a door to enter into the castle. She soon found one. The door was decorated with paintings of roses and flowers. Maika knocked on the door three times. “Come in dearest one,” said a sweet voice from the other side of the door, Maika pulled the door handle and entered into the castle. There stood the loveliest lady Maika had ever seen. She had hair like liquid gold glowing like a thousand suns, her gown was the silvery white of the moon and all around her a thousand little flowers grew. “Welcome Maika,” she said and smiled to Maika, “I have been expecting you. You have been so brave to come this far. I am, I believe, the one you seek, for I am the Lady of the Spinning Wheel, and you have come here to ask my council I expect?” “Yes,” replied Maika, “I have come to ask you if you know what happened to the snow.” “Yes, yes I do,” said the Lady of the Spinning Wheel. ” A long long time ago stories and fairy tales lived happily on earth, they were told and retold, loved and appreciated by all, especially children. Children would dream of the stories and even make up their own. But then slowly slowly people forgot about the stories, they forgot about the olden days and the legends of ancient times. When that happened the stroies started disappearing one by one. And you see Maika, stories are what make up our lives, stories are what rule time, and when stories are no more, then I cannot spin anymore, and when I cannot spin anymore, the wheel of the seasons will not turn. Lives are stories, Maika, and when we believe in our own magic, our story will be full of that magic.” “So how will I get the stories back, so that the snow can return to earth?” asked Maika. “That is out of my hands,” said the Lady of the Spinning Wheel, “you need to go the Magic Forest, where the stories live.” “Then will you help me to get there?” asked Maika. The Lady of the Spinning Wheel smiled warmly at Maika. She nodded her head and lifted her hand in a twirling gesture, and out of the castle wall a door appeared. “Go, my dearest one. Take your courage and your determination with you, but most of all remember your imagination, for that is where your magic is.” Maika smiled and waved to the beautiful lady as she walked confidently towards the door to the Magic Forest. Maika stepped through the door in the castle wall and found herself in a forest. It was the loveliest forest Maika had ever seen. There were wildflowers growing everywhere, pink, blue, violet, lavender, cream, they all glittered and shone as though they were made by magic sparklers. The trees were so tall, they seemed to grow right into heaven and the ground was green and luscious and full of little colorful bugs going about their daily work. Maika could see butterflies and birds fluttering around, it looked as though they were playing in rainbow lights. A tiny bird came and settled on Maika’s shoulder, it looked at her and started singing a happy tune. Maika smiled, she loved the Magic Forest! She stepped on to the path in front of her and started walking aimlessly around breathing in the beauty of the magnificent forest. Then all of a sudden she heard a sound of leaves rustling, and the swooshing of wind and stamping of feet. The sound came closer and closer and grew louder and louder. Could there after all be something sinister lurking in this magical place? 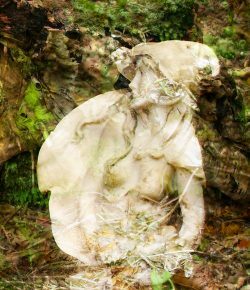 The sound came closer and closer until Maika could see a tall figure stepping out from behind the white-flowered trees. Maika give a little scream of delight, it was a unicorn! And there right behind it was another unicorn! There was a whole herd of them! Maika had heard about unicorns in her grandmother’s stories, and she had always loved them the best of all the fairy tale characters. Maika was not afraid of the unicorns at all, and she ran up to greet them. “Hello beautiful unicorns,” she said politely, ” my name is Maika, and I am so delighted to meet you!”. The unicorn standing closest to her bowed its head and replied: “Hello Maika, my name is Renata, and these are my friends and family. May I ask what it is you are doing here in the Magic Forest?” Maika felt that perhaps they thought she was trespassing, and she hurried to explain that she had been sent by the Lady of The Spinning Wheel to look for the lost stories and bring back snow. “I see, ” said Renata, “The Lady of the Spinning Wheel is a great friend of ours, so you are our most honorable guest. But to find the answers to your questions, you need to speak to our queen The Dreamweaver Empress.” “Oh, can you take me to her?” asked Maika as sweetly as she could. “Yes, yes we can,” replied Renata, “follow us”. And Maika followed the herd of unicorns deep into the Magic Forest. After a long walk into the depth of the Magic Forest, Maika and the unicorns reached a clearing in the woods. It was a beautiful spot covered in wildflowers and green grass. The sun shone brightly through the white clouds above. “Wait here,” said Renata, “I will call her.” Maika sat down in the grass and waited. After a little while Renata came back with a unicorn that was so breathtakingly beautiful that Maika had to let out a little cry of delight. There was no doubt that this was the Dreamweaver Empress. Her coat shone in silver with a sparkle of liquid diamonds, her mane and tail were glowing with rainbow dazzle. “Hello Maika,” said the Empress to Maika, ” I am the Dreamweaver Empress. Welcome to my humble abode. My sister Renata says you wanted to see me.” “Yes,” said Maika in a little shaky voice, she was completely in awe of this gorgeous creature. ” I want to bring snow back to earth. Can you help me?” ” I can only guide you on, Maika,” replied the empress, “you are the one who can bring the snow back. But in order to do that, I need to tell you something first. A star, the most beloved star of all the worlds has been trapped. Stars, Maika, are memories, and this particular star carries the memory of all that is good and kind. It is the brightest star in the sky and it shines only in midwinter on the night the sun turns towards the light, the night the humans call Christmas eve. You need to find this star, Maika, and release it from its prison, only then will snow fill the skies of earth again.” ” I don’t understand,” whispered Maika softly, “I am just a little girl, how can I free a star all by myself?” The Dreamweaver Empress touched her gently with her muzzle. “Maika,” she said, ” You are a child of earth, a daughter of Gaia, you carry within you more magic than you think. You need only believe Maika, believe in yourself, and the magic that lives within you, for it is in this magic you will find the lost stories, not in this forest. Go back to earth Maika, to the forest your friends found you in. I believe your answers will lie there. Your friends are already waiting for you there.” “But how will I get there?” asked Maika. The Dreamweaver Empress looked at her with her soft black eyes, and gave a little chuckle. To Maika’s amazement and joy she saw that Renata came towards her and beckoned her to get on her back. It was Renata who was going to take Maika back to earth! Renata positioned herself next to a big stone on the ground so that Maika could comfortably climb unto her back. “Have a safe journey you two!” called the Dreamweaver Empress as Renata took off and cantered up up to the sky above. Maika laughed out loud! Renata’s movements were so gracious and elegant, Maika felt as though Renata was not only moving but that she was dancing, pirouetting like a ballerina over the clouds. White birds wheeled in the sky and tiny butterflies fluttered about, trying to keep up with Renata. Soon the surroundings changed, colors started appearing, the sun set, then it rose again, stars danced, a moon appeared and disappeared, and soon it was dark, then pink light like a blazing sunrise filled the sky, then evening orange, until it was dark again. “Hold on Maika!” Renata called out, “we are about the enter the door to earth, the air will soon change, it will spin like a twister for some time. Don’t fall off!”. Maika grabbed hold of Renata’s mane and held her breath as the two of them disappeared into a whirlwind of spinning pink clouds. Renata landed safely on the mossy ground of the forest after a turbulent flight through the pink clouds. She shook her mane wildly and laughed, “Well, Maika, that was a lot of fun, but here is where I leave you. I have to go back to the Magic Forest and to my sisters. But you will be safe here. I expect you will find your friends soon.” Maika stroke Renata’s neck and put her cheek on her muzzle, “good bye dearest Renata. It has been so lovely to meet you. Safe Journey back.” Renata kicked off from the ground and cantered up into the sky and disappeared behind the clouds. “Maika, Maika, there you are! We have been looking for you!” Raven flew out from the trees and settled on Maika’s shoulder. Not long after Rein also joined them. “Now you will have to tell us what you have learned about how to bring back snow.” said Raven eagerly. And Maika started her story. She took her time, describing all the details of her adventure and recalling each word spoken to her by all the magical creatures. When she had finished, Raven and Rein seemed quite mesmerized. “So the answer lies with you,” said Rein inside her mind. “It is you Maika who will bring back the snow.” Maika looked down to the ground. “But I have absolutely no idea how to do that!” she said desperately. “Try the Snow Globe,” suggested Raven, “It holds within all the magic of the winter realm.” Maika fetched the snow globe from under her coat. She stared into it, but all she could see was her own reflection. She looked at Raven, but this time even Raven did not have any answers. “Why don’t you tell us one of your stories?” suggested Rein inside Maika’s mind. Maika did not understand what he meant, but then she remembered the words from the Spinning Lady and the Dreamweaver Empress: “Magic is inside you.” And Maika started telling her story, a story of a girl and two talking animals and a witch and unicorns, and as Maika’s words leaped from her mind out into the quiet forest, something strange happened. Rein and Raven seemed to change, and shift and re-shape right in front of her very eyes! They were no longer a reindeer and a raven, but a majestic ice bear and a beautiful princess! “I’m doing it!” thought Maika to herself, ” I’m making magic!” And as her self-belief grew so did her story, it became more and more detailed and imaginative, and soon a star appeared in her story and lovely white snow fell from the sky, and as Maika described the beauty of the snow and the glow of the star, something happened in the black sky above them. It became deep indigo blue in color and a tiny golden speck emerged from the blueness. The speck expanded and grew until it became a bright brilliant star! The star lit up the entire sky and the forest too, then it started wheeling, it danced and twirled towards Maika, the Ice Bear and the beautiful princess until it was just above their heads, then suddenly it changed and in place of the star a beautiful blue-clad lady appeared. Her hair was as black as night and her skin as white as snow. “Hello daughter,” she said and looked at the princess, who just a few minutes ago had been Raven. “You look as lovely today as you did all those years ago when I was taken from you.” “Mother?” said the Frost Princess hesitantly. She had never known that she had a mother. “The beautiful lady nodded her head, “yes daughter, I am your mother, I am also the star the humans call the Christmas Star, and I have been trapped for many many years. That is why your father could not make it snow on earth.” “Then why didn’t he just say so,” said the Frost Princess a little frustrated. “Maybe he did not know himself, or maybe he just needed you to find out for yourself.” Just then a roaring sound was heard in the sky, and Maika saw, to her wonderment, a man appearing in the sky. “My dear Snow Queen!” said the man and embraced the beautiful lady. “I have missed you so much.” “My darling King Winter, you look not a day older.” replied the Snow Queen and kissed the Winter King’s cheek. Now they both came to stand next to the Frost Princess. They grabbed hold of each other’s hands and formed a circle. “And now, my dearest bravest Maika,” said the Snow Queen and looked fondly at Maika, “you will get your Christmas gift, and you have certainly earned it, for it is you who have brought us together, as well as brought back the stories to earth, and now you will have your snow.” King Winter roared, and his voice thundered in the sky and soon the clouds opened up, and little white flakes of snow started falling towards the ground. Maika reached her hands out and tried catching the flakes, but they melted instantly in her hand. She laughed in delight! The snow grew wilder and wilder and fell heavily to the ground. Soon the whole ground was covered in white beautiful snow! Maika turned towards the Frost Princess and her family to thank them, but they were not there! Maika searched and searched but she could not find a trace of them “They must have gone home,” Maika thought to herself sadly. She looked to the sky again and smiled when she spotted the beautiful Christmas star shining so brightly up there, “Merry Christmas Snow Queen,” said Maika softly, “Merry Christmas Frost Princess and Ice Bear, and merry Christmas King Winter. I will not forget you, and I will keep telling your story, and mine too, to everyone I know and meet.” And so Maika turned around and walked out of the Forest and home to her little cottage.